Come with us on an Andean adventure as we travel from the Chilean city of Santiago to the magnificent Inca citadel of Machu Picchu in Peru. Along the way we explore Cusco, the historical capital of Peru, traverse the spectacular salt flats of Uyuni and visit the city of La Paz, 'the city that touches the sky'. Arriving in Santiago today, we check into our centrally located hotel. One of the most scenic destinations in South America, Santiago lies in the imposing shadow of the majestic Andes, and the old part of the city, around the Alameda, contains an array of fine buildings, statues and gardens, which we will be exploring over the next two days. Our intention this morning is to take an orientation tour of the city, including the impressive Presidential Palace and the monastery of San Francisco. We aim to take in the Government Palace of La Moneda, as well as the cultural heart of both the city and the country, the Plaza de Armas. In the eclectic Bellavista district we can find the unusual house of the famous Chilean poet and Nobel Prize winner Pablo Neruda (optional visit), just one of the many artists and writers who made this charming city their home. We also plan to visit San Cristobal hill to enjoy spectacular views out over the city. This afternoon has been left free to explore some more of the city, to wander its streets and parks and perhaps the vineyards that lie on the outskirts of the city. The Maipo Valley is considered by many to be the best winegrowing region in the country. Certainly the oldest, it is renowned for its Cabernet Sauvignon and a tour of the vineyards, lying in the shadow of the magnificent Andes is the perfect combination of sensory delights. Alternatively there is the option of a trip to the nearby city of Valparaiso, Chile's cultural capital. Once a colonial port linking trade with neighbouring Peru, the city suffered numerous raids at the hands of pirates, including Sir Francis Drake. Reaching the height of its prosperity during the 19th century it finally fell into decline with the onset of the steam age and the opening of the Panama Canal. The city today is a major port and its surrounding hills, a natural amphitheatre covered in colourful houses and mansions, are a UNESCO World Heritage Site. Flying to Calama early this morning we transfer by bus to the oasis town of San Pedro de Atacama (2400m), set high among the spectacular volcanoes of Los Andes Cordillera and our gateway to the dramatic landscapes of the Atacama Desert. Arriving later this morning there will be time to relax, or perhaps take an optional visit to the impressive archaeological museum, containing the collection of artefacts assembled by Padre Gustave Paige, a Belgian missionary who spent some 25 years here during the later years of the last century. This afternoon we will take a walk amongst the dunes of the nearby Valle de la Luna (Moon Valley), a nature reserve to the west of the town, where the surreal landscape has been formed by the erosion of the salt mountains, and where we intend to watch the setting sun cast its golden glow across the spectacular landscape before returning by bus back to San Pedro. Before the arrival of the Spanish San Pedro was the centre of the Atacama culture, and its dusty streets and evocative setting still exudes an air of times long past. An early departure by bus this morning sees us heading through the desert landscapes of the remarkable Atacama, one of the most barren and dramatic natural features in the entire country. Our destination is the remarkable El Tatio Springs, a geothermal field of spouting geysers and steaming fumaroles surrounded by a vista of volcanic mountains. Arriving in time for the sunrise affords us an opportunity to witness these active geysers in the golden light of the rising sun. Returning to San Pedro via the volcanic landscapes we then have the rest of the day free to enjoy at our leisure. One possible option for this afternoon is to take a visit out to the extensive salt flats of the Salar de Atacama, at 300,000 hectares the third largest area of salt flats on the planet. Rich in minerals, the lake is home to flocks of pink flamingos during the winter months and the air out here is so dry that the views across the Salar have to be seen to be believed. Driving to the Bolivian border at Hito Cajon today we will meet with our new transport and cross the expansive landscapes of the altiplano by 4WD. During our last moments in Chile, we drive over a high pass at 4650m, the highest point of our trip. Our journey takes in the windswept views and spectacular waters of Laguna Verde, lying before the imposing slopes of the Lincancabur Volcano (5960m). It is said that the winds change the lake's colour, from a deep azure to a vivid turquoise as it whips across the rippling surface. From here we continue past Challviri Lagoon, onto the amazing blood-red depths of Laguna Colorada, home to rare James flamingos who feed on the rich red algae that cover the lake. Travelling across the surreal and tortured lands of the high altitude plains of the Siloli Desert we then head for Villamar, our destination for the night. Day 6 - Discover the Uyuni Salt Flats. Today we travel via Ollague Volcano and San Juan into a desolate wilderness of scrubby wasteland. Salt deserts add to the barrenness, but pockets of cultivation and settlements within this seemingly inhospitable land stand out like oases. The landscape is surreal in the extreme, the bright blue of the skies contrasting sharply with the blinding white salt crust. Flamingos inhabit the shoreline, whilst the snow-capped peak of Volcan Tunupa (5400m) looms far in the distance. Crossing the salt flats we then head for Incahuasi Island, where we find an expanse of huge cacti occupying an isolated island in the heart of the Salar de Uyuni. The island once lay beneath the lake that covered this area some 40,000 years ago and all around are scattered rocks that look like ancient coral beds. The cacti themselves have been here for millennia and some tower some 6 metres above the floor of the plains, no mean feat given that it is estimated that they only grow one centimetre a year! Time-permitting, we will travel to the petrified pre-Columbian mummies of Pucara de Aique, a sacred site that occupies a small canyon at the base of Tunupa. Otherwise, we move directly on to Colchani, driving across the desert pans to visit a salt works, where villagers have sent piles of salt to be ground and iodised before being sold. The small village marks the extreme edge of the salt pans. Our adventure continues by public bus across the mineral rich highlands of southern Bolivia today as we head for the UNESCO Heritage town of Potosi. We drive in our 4WD vehicle to Uyuni bus station, where we pick up our bus towards the branches of the branches of the Andes Range. The views on the road are fantastic, a mass of different colours and weird formations caused by erosion. We'll also be travelling through remote villages, whose inhabitants are dedicated to basic agriculture in this harsh landscape. After an approximately 6 hour drive, we reach Potosi, which lies beneath the towering peak of Cerro Rico at a lofty 4090m above sea level. The Spanish were attracted to these high terrains by the promise of abundant deposits of silver and zinc and during the early years of the 17th century the town itself was the largest in the region, producing over half the silver found in the Americas. The pink conical slopes of the mountain are peppered with old mines and one Spanish writer once described it as 'the mouth of hell'. Conditions even today are still very basic, with all the work being done by hand and with the most primitive of tools. However, as it is a cooperative and the miners can work what hours they want and sell what they extract to the cooperative at the market price. Potosi itself is considered one of Bolivia's finest historical monuments, a city littered with ornate mansions and glorious Baroque churches. This morning we take a tour of the city, its architecture accentuated by the bright clear light that bathes the landscape, made even more intense by its high altitude. An interesting overview of the city's varied past can be found in the Casa de Moneda, the original royal mint built in the mid-1700's, which now houses a variety of displays, from wooden colonial-era minting machines and religious art, to Tiahuanaco artefacts and Bolivian war relics. It even has the country's first locomotive. This afternoon we depart for Sucre by local bus. A UNESCO Heritage site, the Bolivian capital is a spectacular surviving example of colonial grandeur, with a number of beautifully preserved churches that reflect a distinctive mix of local and European influences. Unofficially known as 'the city of four names', Sucre was originally known as La Plata, until new territorial divisions in 1776 saw it changed to Chuquisaca. In the mid-1800s its name was changed once more, this time to its present incarnation, in honour of the second president of the country, Antonio Jose de Sucre. Its final moniker has more to do with the whitewashed walls of its central buildings which, repainted every year, have earned the city the name of La Ciudad Blanca - the white city. This morning we will take a tour of its cultural heart, affording us a little taster of its colonial charm. The 17th century cathedral in the centre of town contains the stunning jewel encrusted 'Virgen do Guadalupe' by Bernardo Bitti, an artist who studied under Raphael and went on to become the first great painter of the new world. We'll also take in the Museo de la Recoleta, which once served as a Franciscan convent, a barracks and a prison and now contains a vast collection of paintings that span some four centuries. The rest of the day is free to continue exploring at your leisure. Bolivia's most attractive city presents a captivating setting to wander through at will. Its large plazas and elegant facades offer an enchanting backdrop, and a walk along its tree-lined streets unearths a rich heritage and a unique insight into its rich history. Sucre has also embraced the future of the country and is renowned as being the country's student capital, investing it with a youthful and relaxed atmosphere that makes it a true pleasure to explore. Leaving Sucre we fly this morning to the lofty heights of La Paz. Standing at 3636m above sea level (higher even than Lhasa in Tibet), La Paz is cupped in the palm of two magnificent mountains and surrounded by the high Altiplano. Its poetic nickname of 'the city that touches the sky' is well earned. Located on the La Paz River, the city was founded by the Spanish in 1548 and its strategic location along the trade routes between the Bolivian silver mines and the ocean helped it to flourish and grow. We will take a tour of the city, enjoying the delights of its vibrant street markets and the captivating grandeur of the church of San Francisco. We'll also take in the pre-Columbian gold and silver artefacts in the Museo del Oro and the fascinating exhibits in the Casa de Pedro Domingo Murillo. Murillo was a martyr of the revolution of 1809 who was hanged in the square that today bears his name and his museum presents us with a rich collection of furniture, textile and artwork that perfectly captures the history of those colonial times. Part of the city tour will include a trip on one of the cable car lines that have rejuvenated the city, bringing in workers from the outlying areas into the 'bowl' of the city centre. Today is free to explore La Paz. It's a good opportunity to explore the old centre further, with its markets and beautifully ornate churches. Alternatively, you may wish to visit the ruins of Tiahuanaco, dating back to approximately 1500 BC. It was one of the most important pre-Inca civilisations and is considered to be one of the most developed in its time. The Kalasaya temple, the Gate of the Sun, the Akapana pyramid are amongst some of the buildings to explore and this can be followed by visiting the nearby pottery and stoneware museum. Alternatively, take a full day trip to the sub-tropical area of Las Yungas, a region characterised by its lush vegetation, its many rivers and waterfalls leading to the Amazon basin, and its diverse flora and fauna. A day trip to Las Yungas is a huge contrast to the high mountains of the Andes, and this day trip includes a lunch at a local coffee company, as well as a visit to the coffee plantations, and a trip to the wildlife refuge at La Senda Verde, home to over 450 rescued animals. From La Paz we head towards the deep blue waters of Lake Titicaca by public bus. At 3810m it is the highest navigable lake in the world and the second largest in South America, after Maracaibo. An immense body of water, its shoreline has been home to Aymara and Quechua communities for millennia. The sacred waters of the lake have long been a site of religious ritual and devotion, from the earliest civilisations in the Americas. Inca conquerors believed the lake to be the site where the Children of the Sun, the legendary founders of the Inca dynasty, Manco Capac and Mama Ocllo, arrived on earth. Our journey takes us to the town of Copacabana; a place of mystic reverence since the times of the Tiahuanaco and which today holds favour with thousands of Christian pilgrims. From here we take a boat out to the Isla del Sol, landing near the Pilkokaina ruins and soaking up the mystical ambience of an island steeped in the legends of the ancient Inca. From here we walk up to our lodge (approx. 200m ascent +1-1.5 hrs of walking at high altitude), where we will be spending the night. The Isla del Sol is the largest of the islands that lie dotted around this spectacular lake, lying just off the Copacabana Peninsula at the southern end of the lake. The island is covered with nearly 200 archaeological ruins that attest to the importance the ancient Incas attached to this site. This morning, we take a short hike in the morning to discover the vistas over the lake, before walking down to the port and taking a boat to the neighbouring Island of the Moon. Here, the ruins of Inak Uyu (Temple of the Moon) are a very well preserved nod back to the island's ancient history, and an excellent place to explore. Views across the lake from both islands are stunning, and if you are an early riser its well worth getting up for sunrise this morning across the Isla del Sol. Taking to the waters again, we continue by boat to Copacabana and then take a charter bus across the border into Peru, following the shores of the lake to its north western corner and the bustling town of Puno. Today we follow the legendary route taken by the first Inca ruler - Manco Capac - on his way towards Cusco. Our destination is in the Sacred Valley at Ollantaytambo. During our bus journey we stop at the beautifully scenic site of Sillustani - a fitting home for the chullpas (funeral towers), which probably date from the 14th century. Driving up to the northern limit of the Altiplano we cross La Raya pass (4,335m) and descend to Cusco. Depending on time, those who wish may visit the colonial church at Andahuaylillas or the Inca temple ruins at Raqchi. The scenery is desolate but magnificent and we may spot flocks of llamas and alpacas grazing on the windswept pastures. We arrive into Cusco in the late afternoon, and from here drive to the Sacred Valley, heading towards our hotel for the evening. A free morning affords an opportunity today to visit the Inca salt pans at Maras and the remote ruins of Moray, famous for its fascinating Inca terraces, known locally as the laboratory of the Incas (optional). These terraces were believed to have been carved on different levels by the Incas, in order to experiment with their crops, each being carved to different depths in order to try and ascertain the ideal conditions in which to grow them. Many still believe the site to possess magical powers and there is certainly no doubting the atmospheric feel and stunning location of the site. This afternoon we then catch the train to Aguas Calientes, the gateway to one of the greatest of all archaeological sites, the mountain complex of Machu Picchu, the fabled 'lost city' of the Incas, probably the most spectacular feat of engineering in ancient America. On arrival we walk to our guesthouse and check in, after which you might like to relax in the thermal baths. Catching the bus this morning we head up to the incredible complex of Machu Picchu. On arrival, it's possible to climb the steep peaks of either Machu Picchu Mountain or Huayna Picchu Mountain to look down on the citadel. Machu Picchu Mountain is a 700m climb from the top of the citadel. There are cobbled stairs all the way up with a few eye-opening drops in some parts, and the round-trip takes about 2.5-3 hours. Huayna Picchu Mountain is only 350m, half the size of Machu Picchu Mountain, but much steeper. There are many more sheer drops, and it is definitely not suitable for someone with a fear of heights. For those who fancy doing the 1 hour climb, you'll be rewarded with world-beating views of Machu Picchu, and the feeling that you're standing on a precipice at the top of the world. The rest of the morning is then spent in this magnificent city, dividing our time between a guided tour and some free time to explore the spectacular ruins privately. Temples, stairways, palaces and gabled stone dwellings are scattered everywhere, testifying to the energy and ingenuity of the builders. Not without reason this site is probably the most revered attraction in the Americas, its location alone is dramatic in the extreme, teetering on the saddle of a high mountain peak that towers above the valley below. This afternoon we then travel by train and bus to Cusco. Today we have a free day to enjoy Cusco, the old capital of the Inca Empire and the oldest continuously inhabited city on the continent. Imbued with an atmosphere of mystery and grandeur, the Spanish-style city of today, with its attractive pink tiled roofs, arcaded plazas and steep winding alleyways, stands upon tremendous Inca foundation stones. A free day here is a fantastic opportunity to explore Cusco's links with the Inca Empire, from visiting the Qoricancha, or the 'Temple of the Sun' , which is a fascinating museum dedicated to Cusco's Inca heritage, to simply wandering the ancient stone walls that line the city streets. We can recommend a visit to the fortress-citadel of Saqsayhuaman (optional), a huge fortress built high above the town, with the aim of defending the Inca empire. Another option is a trip out to nearby Pisac to visit its market and perhaps explore the magnificent ruins of its citadel. Strategically located at the head of the Urubamba Valley, Pisac once controlled the road connecting the Inca Empire with Paucartambo on its eastern borders and the magnificent Inca ruins that once so dominated this valley still occupy the mountainside above the town. On market days the square is awash with noise and colour as vendors trade local produce for medicines and tools and there are bargains to be had amongst the weavers and potters. The ruins occupy a rocky spur, its citadel strategically located at the head of the gorge, overlooking the patchwork of fields and terraces that dot the valley floor. Climbing up to the ruins you pass through a magnificent collection of temples, palaces, terraces, solstice markers and baths. Santiago de Chile - Visit to Valparaiso US$ 110 (min 3 pers), Wine tour US$ 69 (min 3 pers). Sacred Valley - Visit to Maras and Moray approximately US$ 58 ( min 4 pers), Whitewater rafting US$ 65 (depending on numbers). 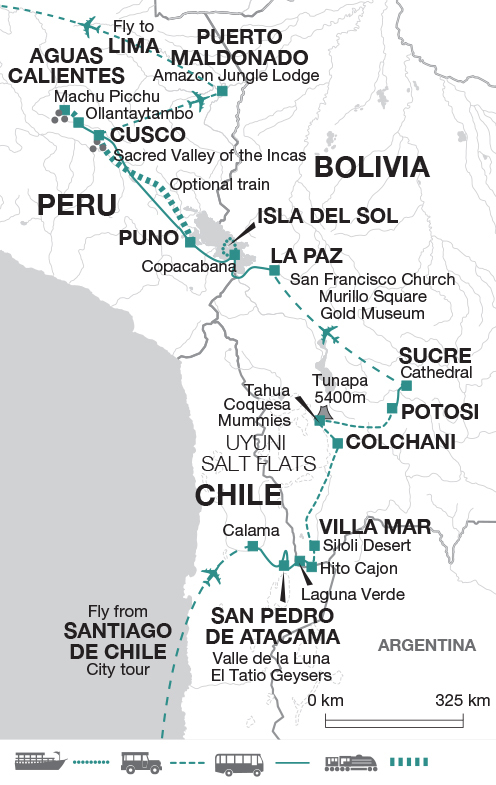 Puno - Titicaca Train £200, subject to availability and cost may fluctuate depending on demand. This must be pre-paid at time of booking and is non-refundable. If you change your passport between your time of booking and prior to travel please take your original passport with you to avoid being fined. Huayna Picchu Mountain - £60; Machu Picchu Mountain £60 - subject to availability - these must be pre-paid at time of booking and is non-refundable. If you change your passport between your time of booking and prior to travel please take your original passport with you to avoid being fined. Bear in mind that several different climatic zones will be experienced. Lightweight clothing is necessary for some warm and humid daytime conditions, though evenings can be cooler, and temperatures at altitude can drop considerably, so please come prepared. The highlands enjoy dry sunny days but extremely cold nights so thermal underwear, a well insulated fleece/jacket and a thick sweater are essential. Bring something warm to sleep in. Lightweight raingear is essential at any time of the year. Bring a swimming costume for the thermal baths at Aguas Calientes. Comfortable lightweight trail boots, trainers and sandals. One main piece of luggage, a daypack plus one small bag for your nights on Isla Del Sol and the overnight in Aguas Calientes where you will leave your main luggage in storage. In Aguas Calientes your main bags will be left in storage in your hotel in the Sacred Valley, and will be transported to meet you when you arrive in Cusco. On Isla del Sol, your main bags will be transported by mules so you only have to carry daypacks. A sunhat and sunglasses are advisable as is high factor sunscreen and lipsalve with sun protection, due to the thinness of the atmosphere. A torch is also useful in case of power cuts or emergencies. Don't forget your camera and a towel. Please note drones are prohibited in most tourist areas in Peru. Bolivia: Visas are not required for UK, New Zealand, Australian, and Canadian citizens. However, US citizens will require a visa. As you will enter Bolivia overland please make sure your passport is stamped on both sides of the border, with an exit stamp from the country you are leaving and an entry stamp on the Bolivian side otherwise you'll have to pay a fine to leave. Peru: Visas are not required for UK, New Zealand, Australian, US and Canadian citizens. Please also ensure that your insurance policy covers you to the maximum altitude of 4650m.